Along with classic cars, great food, and even a special “Kid Zone”, Smiley and the Cookie Cruiser loved being a part of the fun of the Rev ‘Em Up for Kids Car Cruise this past Sunday. Benefitting the Bethel Park Junior Football Program, the Car Cruise was held at the South Park Fairgrounds and drew a big crowd, despite the rainy weather. Kids and adults of all ages came to decorate and enjoy an Eat’n Park Smiley Cookie from Team Smiley. A few people were even brave enough to draw a classic car on their cookie! 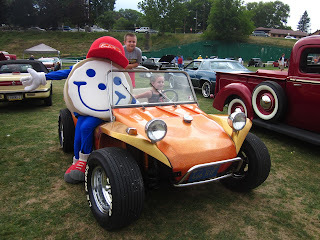 Smiley also strolled the Car Cruise and delivered cookies to the crowd. Team Smiley loved hearing so many Eat’n Park stories, especially ones about Smiley’s birthday party, which took place Friday at the Bethel Park Eat’n Park. Some kids were lucky enough to decorate two cookies in one weekend! Overall, everyone had a great time looking at the many classic cars that covered the fairgrounds. 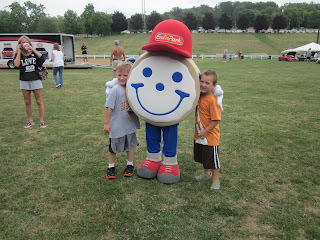 It was a great way to spend a Sunday afternoon, and Team Smiley was happy to be a part of such a fun event!